I wonder what 1925 has in store for us? On many points we can prophesy with a reasonable amount of certainty, but on many more, we are at sea. We shall continue our accustomed runs, we shall still have to fight adverse elements, we shall still have some cherished idyll, but the rest? What will the general run of weather be, 1921 or 1924? Where will our wandering wheels lead us? These questions form the theme of much interesting speculation. As I sit here, at home, just recovering from a sudden dose of flu, I find myself running back through 1924, and conjuring up some vision of stormy days, of sunny days and of dark days. Of course, the former and latter have been predominant, but what matters that? Nineteen twenty-four has been a bumper cycling year in every way. It is said that the New Year cannot be worse. I shall not grumble if it is no better! Tom Idle and I have had several early starts last year, and they all proved exceedingly satisfactory, although on each there was an excessive rainfall. We have seen more of glorious Derbyshire, more of northeast Wales, more of Cheshire, and I have had my first run in the district of Shropshire south of Shrewsbury. We have completed two all-nighters, both of which were summery idylls, and yielded to us the greatest amount of pleasure and enjoyment. In fact the whole of the runs have tended to earlier starts, and now, we consider a late start what an early start used to be. This lengthening of runs, this adding a little at each end of the day, shows increasing enthusiasm, which will not be damped by adverse weather conditions. I completed no fewer than 18 runs of over 100 miles, two of which constituted a double century. That they were not runs of just a century may be gathered from the fact that the average for the 18 was no less than 131.3 miles each run, the longest being 212, and the shortest 106. Their combined mileages were 2,364 miles. Of course, mileage is nothing when compared with sheer scenic enjoyment, but, as I am continually trying to force on those whose range constitutes about 30 or 40 miles, it goes a long way. A cyclist who will not try to ride beyond the Manchester Ship Canal or the River Ribble, will never see beyond those boundaries, just as much as one who can ride a century only on main roads, will never have a range of vision stretching beyond the strip of tarmac or asphalt. Both are bad mistakes. One hears from people at home or at work “Have you ever been to Manchester on your bike?” To an experienced cyclist – or an ‘enlightened’ cyclist, this question is absurd. Whoever wants to go to Manchester? We know of ways to miss Manchester when we wish to get to the country beyond. They are as bad as the people who tell us that 40 or 50 miles is quite far enough in a day. If we can get some new scene of beauty 25 miles from home, then we are content to linger awhile here, but there are 52 Sundays to a year. Then one is told that one is a fool to “turn out on a day like this”, the day being one of the usual rainy kinds, but when we get home, we invariably find that we have missed most of the rain. If not, we have had a ‘fine wet day’. But we are concerned with 1925. Tom and I have booked several runs for 1925. We have made several good cycling resolutions, some of which will be broken, but others will not. ‘To do more, and yet more cycling’, ‘to have more early starts’, ‘to have more all-nighters’, to try and get others to realise that this is the only pastime, the finest way of seeing England, and thereby to get more members for the old club, the CTC. These are some of the resolutions, let us see in the following pages how well they are kept. A land of marvels without end. Still greater things beyond the bend’. So here’s to a good all round year of cycling, may we have many long runs, all-nighters, potters and pass-storms. May we have just a little more sunshine, some rain, some wind, a bit of everything that goes to make real cycling worthwhile. And here’s to the lively little lightweight that makes it all worthwhile. ‘At last’, they said, ‘he has come to stay, at last he is satisfied’. And all I know, I must rise and go, whenever it calls to me. And well I know, I must rise and go, whenever it calls to me”. By rights, half of this page should belong to last year, but it is obvious that it cannot do so. The reason is that we met at Belmont on December 31, and dispersed from there on January 1. 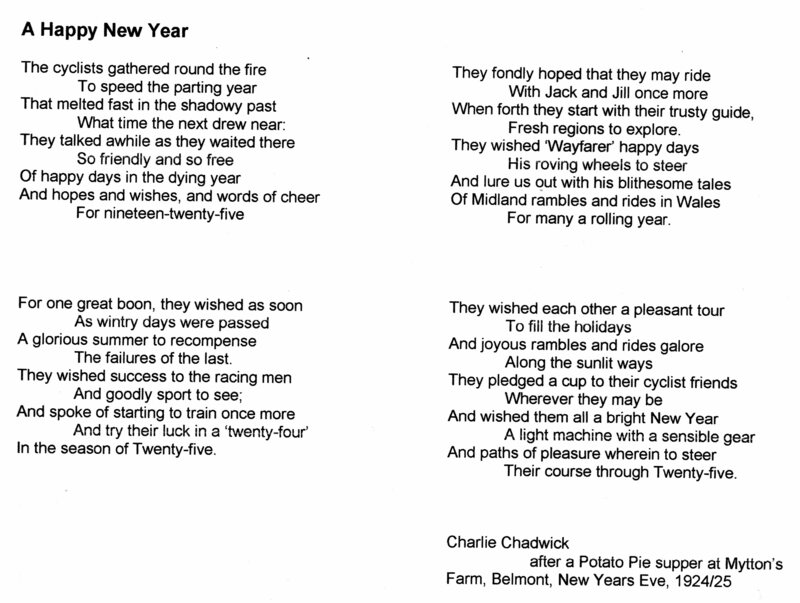 The Section had arranged a sing-song to take place at Mytton’s Farm, Belmont, on New Years Eve, and not wishing to be out of it, I decided to go. This decision was against all advice at home, as I had got a dose of the ‘flu’ and could hardly stand up, but a hot bath seemed to banish it for the moment, and I saw no reason to stay at home. I started about 10.30pm, and when I got into the centre of Bolton, discovered myself trapped by the New Years Fair. I had a bit of a struggle to get out of it. Traversing Blackburn Road, I soon reached Astley Bridge, where the long tramp up to Wilkinsons Sanatorium started. The night was dark and the sky starry, and on remounting, I discovered a strong wind in my favour, levelling up the gradient a little, and soon bringing me to Belmont Village. From Belmont, the road runs by the side of a large reservoir, then at the farmhouse, half a mile past the village, I turned left through a gateway along a muddy track that seemed to lead into the heart of the moors. In front, at some distance, the light of Bromilow Farm twinkled, and grew bigger as I drew nearer. At last I reached the outbuildings, about one of which were standing some forty machines. Leaving mine amongst them, I made across the bridge without parapets to the farmhouse, just as it was starting to snow. I was late – I knew that – and supper had been disposed of. Just when I entered Mr Fred Boyle was giving a Burns recitation – Tam ‘O Shanter I think it was. Mark Haslam then gave us a few verses he had made up to the tune of ‘It ain’t gonna rain no mo’, which created a good laugh. A play then took place, ‘Aladdin’, and it produced roars of fun. Miss Hallam gave us about six verses of ‘Old King Cole’, more songs and recitations being given afterwards. Then all had a sing-song until 2am, when chocolates and Gingerette – which was likened to Waterette – were distributed. At 2.15am, ‘Auld Lang Syne’ was sung, and we dispersed. I got clear in the first party, and soon got on to the main road, over which was a layer of snow.